In the animal kingdom, certain animals determine the location of an object by producing sounds, then interpreting the echoes that are created when those sounds bounce off the object. This process is called echolocation. The only animals that use this unique sense ability are certain mammals—bats, dolphins, porpoises, and toothed whales. It now is believed that these animals use sound to "see" objects in equal or greater detail than humans. Mammals developed echolocation as an evolutionary response to night life or to life in dark, cloudy waters. Long ago, bats that ate insects during the day might have been defeated in the struggle for survival by birds, which are better flyers and extremely sharp-sighted. Similarly, toothed whales, porpoises, and dolphins might have been quickly driven to extinction by sharks, which have a very keen sense of smell. These marine mammals not only compete with sharks for food sources, but have themselves been preyed upon by sharks. Echolocation helps them find food and escape from predators. Decibel: A unit used to measure the loudness of sounds. Frequency: For a sound wave, the number of waves that pass a given point in a particular amount of time. Mammal: Warm-blooded animals that have a backbone and hair or fur. The female mammal has mammary glands that produce milk to feed her young. Predator: An animal that hunts, kills, and eats other animals. Echolocation in bats was first clearly described by scientists in 1945. 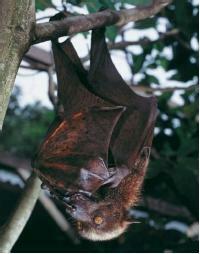 Bats that eat frogs, fish, and insects use echolocation to find their prey in total or near-total darkness. After emitting a sound, these bats can tell the distance, direction, size, surface texture, and material of an object from information in the returning echo. Although the sounds emitted by bats are at high frequencies that are out of the range of human hearing, these sounds are very loud—as high as 100 decibels, which is as loud as a chainsaw or jackhammer. People may hear the calls as clicks or chirps. The fruit-eating and nectar-loving bats do not use echolocation. These daytime and early evening bats have strong eyes and noses for finding food. One question that had puzzled scientists is how a bat can hear the echo of one sound while it is emitting another sound; why is the bat not deafened or distracted by its own sounds? The answer is that the bat is deafened, but only for a moment. Every time a bat lets out a call, part of its middle ear moves, preventing sounds from being heard. Once the bat's call is made, this structure moves back, allowing the bat to hear the echo from the previous call. Echolocation may work better underwater than it does on land because it is easier for sound waves to travel through water than through air. Echolocation may even be more effective for detecting objects underwater than light-based vision is on land. Sound with a broad frequency range interacts in a more complex manner with an object it strikes than does light. For this reason, sound can convey more information than light. Like bats, marine mammals such as whales, porpoises, and dolphins emit pulses of sounds and listen for the echo. Also like bats, these sea mammals use sounds of many frequencies and a highly direction-sensitive sense of hearing to navigate and feed. Echolocation provides all of these mammals with a highly detailed, three-dimensional image of their environment. Whales, dolphins, and porpoises all have a weak sense of vision and of smell, and all use echolocation in a similar way. The mammal first emits a sound pulse. A large fatty deposit found in its head, sometimes called a melon, helps the mammal to focus the sound. An echo is received at a part of the lower jaw sometimes called the acoustic window. The echo's vibration is then transmitted through a fatty organ in the middle ear where it is converted into a nerve impulse that delivers the information to the brain. The brains of these sea mammals are at least as large relative to their body size as is a human brain to the size of the human body. Captive porpoises have shown that they can locate tiny objects and thin wires and distinguish between objects made of different metals and of different sizes. This is because an object's material, structure, and texture all affect the nature of the echo returning to the porpoise. I love dolphins, and there is a lot of facts & information about dolphins, i loved the article. Thanks, great article. Had good extra information about echolocation which weren't on other major sites. had to find article for school about echolocation, glad I found this! THIS WHAT I AM STUDING IN CLASS, SCHOOL. Birds are not better flyers than bats. Bats are much more efficient flyers than birds. Your reasoning that bats were crowded out by birds is wrong. Bats evolved tens of millions of years after birds.